Even though it’s not actually that long ago that I finished nursing Little A (just eightish months ago), I was wondering if it would be a similar experience nursing this time around, or if it would be different – maybe even harder? So I was happy to find that it really is just like riding a bike. Baby L was just as quick to latch on and get into as Little A was and I was happy to find it was less painful for those first couple of weeks than it was last time. Luckily, both of my babies have been great nursers, since they both had a lot of weight to gain in their first days, weeks and months. Alec because he lost a ton of weight in his first days, and Louis because he was born teeny tiny. Producing enough milk is something that I think all mothers think about, especially in the beginning. And I was determined to be more conscious of my production this time around, knowing that it would be harder to think of myself with two little ones around. I would also like to be able to build up a better freezer stash of pumped milk to last through weaning this time. For me, this simply means making sure I am getting enough nutritious food to eat and that I am staying really really hydrated. Also, I am eating lactation cookies like it’s my job. Lactation cookies are built on the concept of “galactogogues” – substances that promote lactation by increasing milk supply. I think they work. 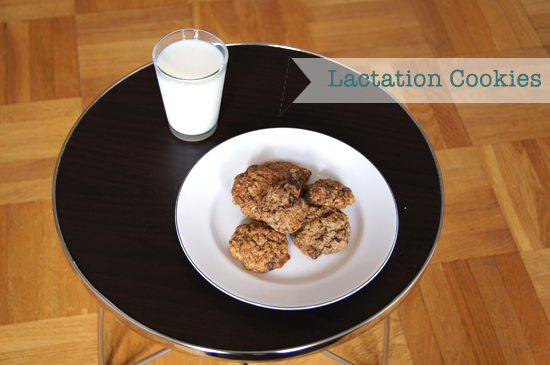 Here is my recipe for lactation cookies. Have a couple with a glass of milk and enjoy! Sift together flour, baking soda, salt, brewers yeast and cinnamon and add it to the rest.